The treatment of illness before the National Health Service in 1948 was unbelievably different from what we have today. My earliest memories are of the 1920s — 1930s; which were themselves much improved from earlier years. Doctors were not normally afforded and the district nurse was a much-respected member of the village community. It was 1883 when the Eton Poor's Estate first paid for a nurse to attend the sick. The Eton Wick population was growing and would have been between 500 and 700. 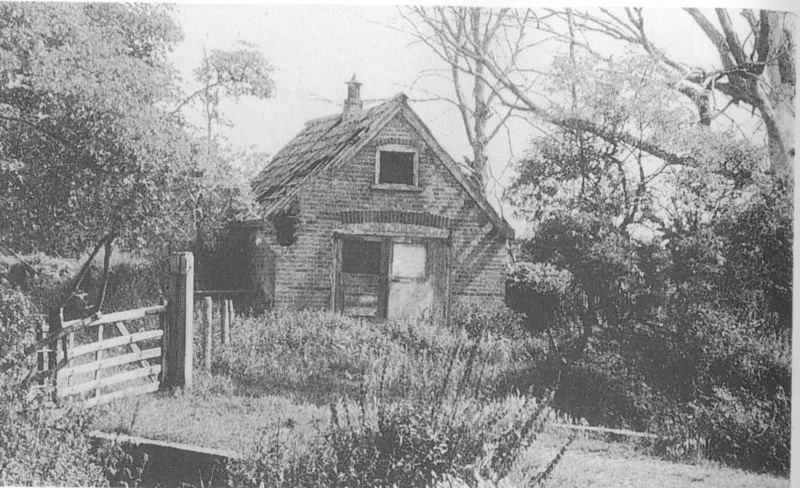 Later a resident nurse was appointed, and she lived in a wooden and thatched bungalow in Wheatbutts orchard. The complaints of scarlet fever, measles, diphtheria, and tuberculosis are fortunately no longer the dread illnesses of yesteryear. I was about 6 or 7 years old when scarlet fever swept through my family, necessitating a six-week spell in the Cippenham Isolation Hospital. The homesick room was sealed and fumigated, and books or soft toys used by the patients were destroyed. While in hospital, visitors could only stand outside the closed window and wave. After the six weeks of isolation we returned home and duly gave the fever to another in the family. My youngest brother, who was barely two years old, was in hospital while I was there. Mother was so worried and asked me to look after Fred. How on earth can a 6-year-old look after a 2-year-old in what I regarded as an alien world. We were ministered regular doses of filthy greenish-grey liquorice water from a dirty chipped enamel cup, presumably to keep us all 'regular'. Even now after 80 plus years, I find myself twisting my nose and mouth at the thought of it. By the time my family had each had scarlet fever my Mother had endured a long summer of weary treks across the 'slipes' (now we call it all Wood Lane) to the Cippenham Isolation Hospital. After WW2 it became a nurses' hostel. Ironically there was an Isolation Cottage Hospital in Eton Wick at this time, but alas, I understand, not for the use of Eton Wick residents. It had been built by the Eton Council in 1883 on the southeast corner of Bell Farm - which the council had purchased in 1875, primarily to enable sewage to be pumped from the town and College, and spread on 'sewer beds' to be located at Bell Farm. Of the remainder of the farm, seven acres were privately sold, a plot at a time, for homes on an area later known as Boveney Newtown, and the remainder was kept as a Council farm. Eton Wick had no main drainage until the mid-20th century, about 60 years later, so could not have benefitted from the sewage farm, and was denied the hospital also. In the early 1800s raw sewage was often disposed of in open ditches and subsequently found its way into the river. In Eton there was just such a ditch along Baldwin Shore (by Baldwin Bridge) surely an unappealing sight and stench in the college area of Eton, albeit up to the 1840s, when it was covered over. The need to use Bell Farm was undoubtedly justified. In 1893 an epidemic of measles caused the Eton Wick School to close for a week but undoubtedly the really dreaded complaint before the NHS came into being was TB (Tuberculosis). Improved drugs and treatment in the post-war years brought hope and comfort for the sufferers. Even naming the illness was often avoided and it became known as 'consumption'. During my own school years of the early 1930s several of my childhood contemporaries died of TB and one particularly poignant memory is of a sad family walking from Alma Road to the village churchyard with a child's coffin held between them. The day of the limousine had not yet arrived, although generally the village builder, Alf Miles, who was also the undertaker, provided a bier. Perhaps even the comparatively minimal cost of a bier was prohibitive. Times were hard but nobody glibly talked of poverty as is bandied around today. village. This was a mortuary that was mostly used for drownings at a time when the river was popularly used for bathing, swimming and sometimes for a 'soap and soak' wash down after a hot day's work. The river was fairly safe for local people who knew it well, and not so safe for the many day trippers who came to Windsor by rail and finished up on the Brocas at Eton. Many will remember the old mortuary which stood in a very dilapidated state for many years after WW2 — long after its infrequent use of the 1920s — 1940s. The Jubilee Oak planted in 2012 to celebrate Queen Elizabeth II 60 year on the throne is approximately 20 metres southwest of the Mortuary and about 120 metres southwest of the Isolation Hospital. Before the mortuary was built in 1913 corpses were often kept in the cellars of local public houses. Perhaps a 'cool keep' but it must have been a deterrent to drinkers wanting a cool pint from the cellar after a hard day's toil. Family medicine cupboards would probably have included Syrup of Figs, Zam-Buk for chilblains, Sloans or Ellimans ointment, eucalyptus for colds, Wintergreen ointment, Iodine, Germolene, cinnamon for fevers and of course bandages and plasters. My family chest also had linseed oil that was mixed with oats when the workhorse had a cold and cough. Dad's greengrocery round required a fit horse at all times; consequently, after cold, wet days the horse was top priority for a dry and vigorous rub down; only after the horse was comfortably stabled would Dad think of changing his own wet clothes. All traders gave their horse this love and care. When trucks displaced the animals the loving concern ended, also bringing, perhaps, a different attitude to work. In the pre-WW2 years, and before NHS, visits to doctors and dentists were avoided as much as possible, despite the facts of chilblains and toothache causing regular trouble. As a village cub around 1932, I well remember a visit to the pack from a Gibbs Dentifrice representative. After distributing hands-full of peanuts to us we were told to chew them for at least 24 times before swallowing. I think perhaps he was the original 'nut case'. Few of us knew about hygiene, and regular cleaning of teeth - it seems incredible now, with so much attention to such matters. We were told we could purchase Gibbs Dentifrice for tuppence (less than 1p). It came in an all tin about the size of a shoe polish tin, and it was pink and hard. nothing like today's range of tubed pastes. A small jigsaw puzzle also came as a 'freebee' with the Dentifrice. Yes! all for less than one new pence. An extraction in the 1930s cost around 3 shillings and 6 pence (17% new pence) and when prescription charges for medicines were first introduced in 1952 it was one shilling (5p), only to be abolished in 1965 and re-introduced three years later. One middle-aged lady very dear to me had all her teeth extracted in one visit to Windsor and then walked home to Eton Wick. Again this was the early 1930s. Hospital patients, of course, were fed, but certainly no menu to choose from, and weekend visitors often took jam or dripping to add a little extra to the afternoon tea. Perhaps I should have titled this article 'Lest we forget'. Click here to read Our Village August 2012. War Memorial Meetings - March 1919.